Extend the life of your hair colour with Clairol permanent Root Touch-Up hair dye. Root Touch Up gives your hair colour a mid dying cycle boost, covering roots and greys when used between regular colourings. The targeted Root Crème works in just 10 minutes and with a blend of tones, matches leading shades, even salon colour. 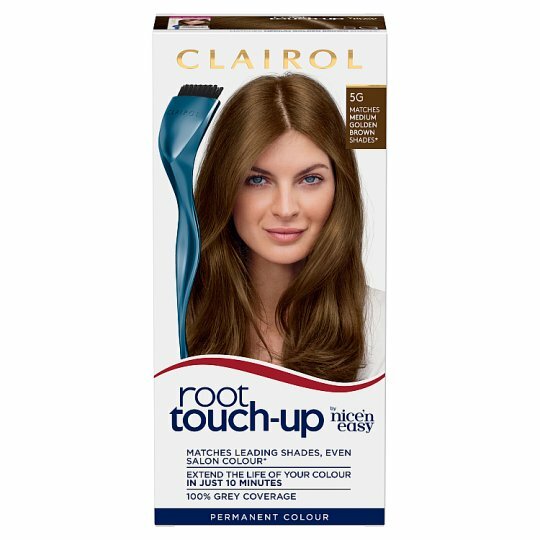 * With a colour suitable for you, Clairol Root Touch Up 5G Medium Golden Brown Hair Dye, you can ensure your roots are never on show. Make use of the included precision brush and easily banish your root line with permanent colour. (*Among leading retail permanent shades and pre-formulated salon colour).